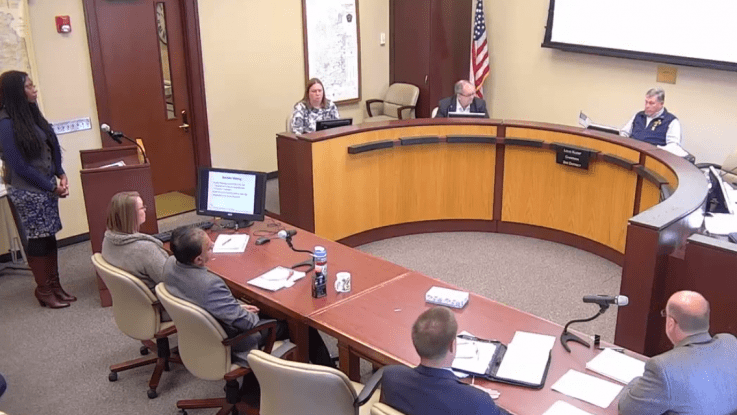 A county commissioner in the state of Kansas is taking heat after making racist comments to a black woman during a public hearing earlier this week. Louis Klemp, a Republican, presently sits on the Leavenworth County board of commissioners. Klemp was not elected to his position but rather was appointed to the role after another commissioner had to resign for health reasons, Newsweek reports. During a meeting on Tuesday, an African American woman who asked not to be identified by local media was giving a planning presentation to commissioners on behalf of an architecture firm she represented. Klemp was apparently asking her a lot of questions during her talk and wanted to assure her he wasn’t trying to single her out — but did so in a way many are describing as racist. Bob Holland, another commissioner in Leavenworth County, said he was embarrassed by Klemp’s statement. It’s not the first time that Klemp has made controversial statements, according to reporting from WIBW. In the past, Klemp has complained about county-recognized holidays, stating that he wanted the birthday of Robert E. Lee to be recognized. “Robert E. Lee [was] a wonderful part of history,” Klemp said. He also questioned the validity of having a national day honoring Martin Luther King, Jr., and wondered why a national holiday for George Washington wasn’t on the books. “If we’re going to have Martin Luther King Day, why don’t we have a George Washington? I think George was a pretty important guy,” Klemp has said. He then questioned whether Oprah Winfrey was deserving of a holiday as well. George Washington’s birthday is celebrated as the third Monday in February and is one of 11 permanent holidays issued out by Congress, according to the National Archives.